Globally aligning rules on how to book sales, as was agreed this week, should create greater consistency. It means more fine print to scour, however, while extra flexibility for U.S. companies could also invite trouble. A cautionary tale may be HP’s allegations against Autonomy. 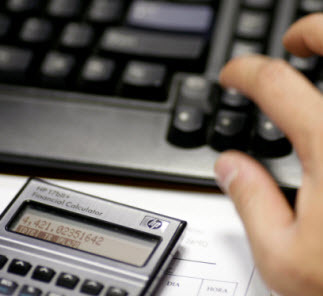 The hand of a broker is seen next to a calculator at Multiva Bank in Mexico City August 9, 2011. Brazil's real and Mexico's peso reversed early losses on Tuesday to gain against the U.S. dollar after the Federal Reserve promised to hold interest rates near zero for at least two years. How could HP find a $5bln gap in Autonomy's value? New accounting rules announced on May 28 will change how companies record revenue in their financial statements starting in 2017. The overhaul was jointly announced by the Financial Accounting Standards Board, which establishes standards in the United States, and the International Accounting Standards Board, whose rules are used in over 100 countries spanning Europe, Asia and parts of the Americas.